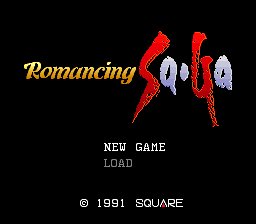 Romancing SaGa is an early-era SNES RPG released by Square in 1992 and designed by Akitoshi Kawazu, the creator of the SaGa series that originated on the Nintendo Gameboy. Taking place in the fantasy world of Mardius, the world is revealed to be one where ancient gods warred against each other in the past, with the ultimate god of evil, Saruin, sealed away by the power of ten gemstones. In modern times, each country is now dealing with its own troubles and wars. But the time of Saruin’s return draws near and threatens the existence of all human life. The player can choose to start the game by selecting one of eight main characters, who each have their own personal storyline that is explored in the game, as well as their own ending. 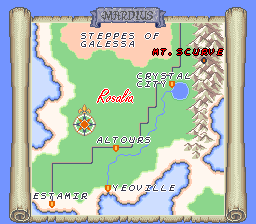 The world is constantly in motion as the player progresses through battles and events, with new locations to find and old locations undergoing changes. Combat is turn-based with a slight emphasis on party formation. As each character battles, they can learn new weapon techniques and grow in different statistics. Romancing SaGa was also remade for the Playstation 2 in 2005 as “Romancing SaGa: Minstrel Song”. 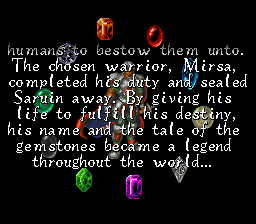 Many of the unfinished or dropped content from this SNES version was included or expanded upon in the remake. 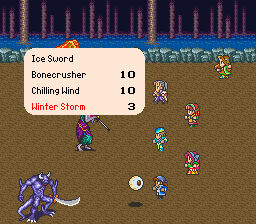 This is an English translation of Romancing SaGa for the Super Nintendo. This translation is based on the unfinished English translation by Trans-Dimension. 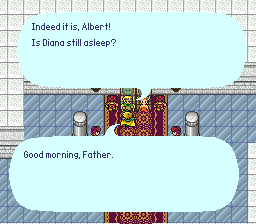 Ah, so Romancing SaGa for the SNES has been translated into English !! After creating my character, I was a bit confused as to where I was suppose to go…but exploration (taking ships and walking) is part of the game. A few tips I can give starting off are…always have a “BOW” equipped to each character, De-Equipping a weapon rests your mastery level of that weapon, keep track of the amount of money you have, only learn/buy healing magic, upgrade/buy your armor before new weapons, and don’t add more party members until you have everyone fully equipped.